With per capita income of just $1,000 and social indicators on a par with countries in sub-Saharan Africa rather than its more successful neighbors Argentina, Chile or Venezuela, Bolivia is one of the poorest countries in Latin America. 10% of children are undernourished. Average school attendance is less than seven years. Entrenched vested interests hamper foreign investment in the economy, while the landlocked geography of the country itself limits access to export markets. But there are signs of change. Annual inflation fell from a peak of 23,500% in 1985 to less than 4.5% by the close of 1998, thanks to a program coordinated by the International Development Association and the International Monetary Fund. And Bolivia's huge external debt burden has been substantially eased under new debt redemption programs. 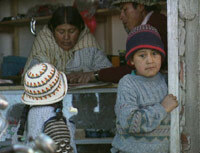 In Bolivian Blues, Life explores the success of a new initiative designed to coordinate the work of donor agencies and focus outside aid on achieving real poverty reduction.